The 2018 Hurricane season in the Atlantic and East Pacific regions is in full swing and officially ends on 30 November. So far, we have witnessed 6 tropical depression/storms and a further 5 hurricanes that were classified at least category 1, the most severe being Hurricane Florence. Hurricanes are the most destructive storms on earth and can cause significant damages and disruptions. This may impact companies positively and negatively. This article uses Hurricane Florence as a case study for which stocks you should be looking at when a high category hurricane is spotted on the radar. Hurricane Florence has descended upon North- and South-Carolina and Virginia in the US. The hurricane was classified as a category 4 hurricane as it approached the US, marking it as the most severe in the 2018 Atlantic hurricane season. By the time it reached the US mainland, the storm was reclassified to a much milder category 1. Thankfully the storm was less severe than expected, but there was still a lot of damage caused by flooding and strong winds. Emergencies were declared in the affected states and many coastal towns were evacuated in anticipation of a severe storm. 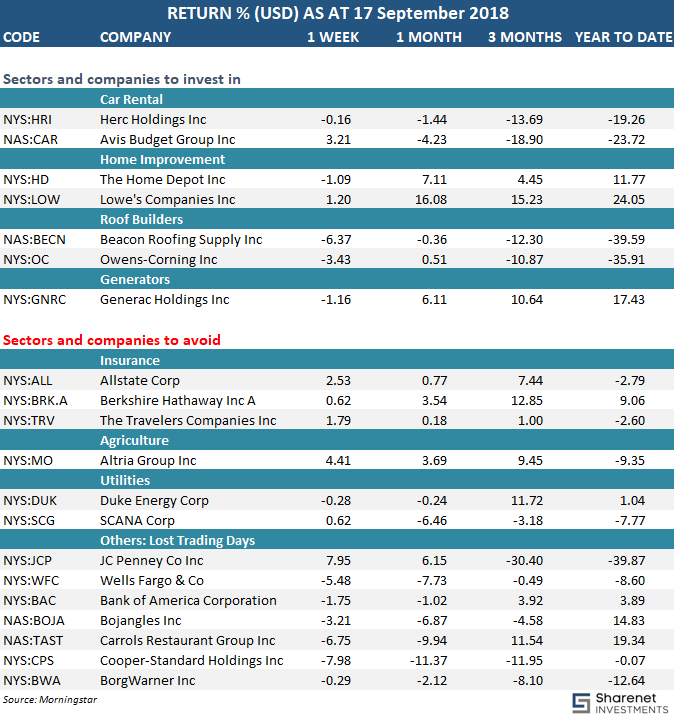 Let’s take a look at the stocks that could be negatively or positively impacted. Car rental: Images of rivers sweeping cars away is synonymous with hurricanes and floods. People affected would rent cars while they sort out their insurance and replace their car. Herc Holdings (Hertz) and Avis are the two obvious players here. Home improvement and roof builders: Damage to buildings will require repairs. The companies most likely to benefit from Florence is Home Depot, Lowe’s, Beacon Roofing and Owens-Corning as these have distribution in the affected areas. Generators: Power outages are frequent in a severe hurricane and increases the demand for generators. Generac Holdings could benefit. Insurance: With hurricanes comes damages and there should be a number of claims that land on insurance companies. Take note of the affected areas and which insurance providers write a lot of their premiums in that region. Allstate Corp, Travelers Companies and Berkshire Hathaway are some of those that have a lot of clients in the region. Agriculture: Adverse weather is a concern for agriculture and farmers in the region could face large losses in their crop if they can’t harvest early. Altria Group grows tobacco in the region and is likely to be impacted. Utilities: Power outages and repairs that follow a devastating storm has a negative impact on energy producers like Duke Energy and SCANA Corp that operate in the affected region. Lost trading days: Towns evacuate and people generally don’t get to doing their typical daily activities like going to restaurants, shopping, banking and booking doctor appointments. Find companies with a large number of branches in the impacted region. All the above stocks are traded on US stock exchanges and you will need an offshore trading account to be able to trade in these stocks. Sharenet Securities offers both local and offshore trading accounts.